Because of some business related travel and other business last week I got a bit behind on 31 Days of Toy Terror. This is technically Day 18, just in case you're wondering. Looking at these figures, I think one of the coolest things about them is how well they capture the beautiful, clean style of Filmation's animated characters. 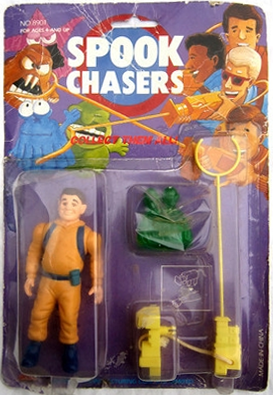 While many Filmation cartoons were based on existing toylines, the Filmation's Ghostbusters toys were directly based on the cartoon. If you have ever wondered what 1980s Masters of the Universe figures would have looked like if they were based off of the cartoon series, this might give you some idea. Fib Face has an excellent animated look that truly makes him look like he stepped right out of the cartoon, comparable to some of the newer Filmation based MOTUC figures like Madame Razz, Fang Man, and ! He stand around 5 1/4 inches tall. My figure is marked with the Schaper branding, not Tyco, in case you were wondering. The articulation on Filmation's Ghostbusters was pretty standard for the era (maybe even a little behind) with most characters receiving five points of articulation (some had less due to skirts and robes). Fib Face features: Shin swivels, swivel shoulders, and a swivel neck. Honestly, his body type and outfit is so odd that I'm not sure what could have been done to give him more useful leg articulation. His arms are posed in a very expressive manner so he looks good just standing around. I always felt he was the least exciting figure in the line, so standing around is probably what he's best at. Since he can swivel at the neck, you an spin his head around to reveal his second face. While the show seemed to give him two separate personalities that argued, I was always more familiar with the toy and figured he had more of a Jekyll & Hyde thing going on. The sculpt is really, really good on this guy. As I mentioned earlier, Schaper totally nailed the aesthetics of Filmation's character design perfectly! Fib Face is clean, simple, and symmetrical with a great face sculpt. The friendly face has the eyes closed and mouth open in a delighted laugh while the angry face has incredibly arched eyebrows, wide open, piercing eyes, and a long frown. He's an odd looking toy, but he was an odd looking character so it's all OK. The only difference between the cartoon and the toy is that the cartoon made the faces look closer together while the toy features them on opposite sides of the head. I love the paintwork. Once again, it captures Filmation's character design perfectly: Bright, bold, and simple. He's wearing a rather striking orange and purple... something. I have no clue what this is. Coupled with the purple pointy hat it looks like something a baby might have worn in the 1960 or something. The green skin is a perfect tone and the little facial details like the eyes, teeth, tongue, and eyebrows are neatly painted. Mine has a little paintwear on a few places, but that's because I've owned this guy since childhood. That's love wear and tear, baby. Fib Face didn't come with any accessories, but I'm not sure what he would have used. Other than Prime Evil's cloak, none of the other Evil Spooks came with accessories either. Filmation's Ghostbusters was a very cool line. They definitely still look quite attractive because of how closely they capture their cartoon counterparts. While they're not on the A-list of 1980s toy properties (they might not even be on the B-list) they're a line that is worth looking into. Schaper made some neat toys and some exceptional vehicles and (fragile) playsets. I have a lot of nostalgia for this line, so it can be tough to rate a figure like Fib Face. Ultimately, his sculpt and paint are great but the articulation, lack of accessories, and character design just don't thrill me. He doesn't really do anything wrong, he's just one of the plainer character in that line. Ultimately I'm giving him a good. Filmation devotees and fans of the toyline itself will definitely want to track him down, but others might do well to pass unless you stumble upon him somewhere.